The press made up "Battle of the Bulge" to describe the way the Allied front line bulged inward on wartime news maps and became the best known name for the battle. After moving from Normandy at the end of July 1944 and landing in southern France on 15 August 1944, the Allies advanced toward Germany more quickly than expected. Success in the west would give the Germans time to design and produce more advanced weapons (such as jet aircraft, new U-boat designs and super-heavy tanks) and permit the build-up of forces in the east. The phrase "Battle of the Bulge" was made up by contemporary press to describe the way the Allied front line bulged inward on wartime news maps. Although it retained most of its armor, there were not enough infantry units because of the defensive needs in the East. These 30 newly rebuilt divisions used some of the last reserves of the German Army. 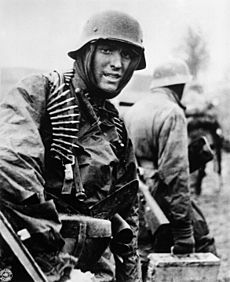 Among them were Volksgrenadier units formed from a mix of veterans and recruits formerly regarded as too young or too old to fight. Training time, equipment and supplies were inadequate during the preparations. German fuel supplies were inadequate. Materials and supplies that could not be transported by rail had to be horse-drawn to conserve fuel. The mechanized and panzer divisions would depend heavily on captured fuel. As a result, the start of the attack was delayed from 27 November to 16 December. Before the offensive the Allies were not aware of German troop movement. During the liberation of France, the French resistance had provided information about German movements. Once they reached the German border, this information was not available. In France, orders had been relayed within the German army using radio messages coded. by the Enigma machine. These could be picked up and decoded by Allied code-breakers at Bletchley Park, to give the intelligence known as ULTRA. German units in the area were given charcoal instead of wood for cooking fires to cut down on smoke and reduce chances of Allied observers realizing a troop build up was underway. Peiper's unit was delayed and his vehicles needed fuel. They took 36 hours to advance from Eifel to Stavelot. Operation Stösser was a paratroop drop into the American rear in the High Fens (French: Hautes Fagnes; German: Hohes Venn; Dutch: Hoge Venen) area. The goal was the "Baraque Michel" crossroads. Checkpoints were set up all over the Allied rear, greatly slowing the movement of soldiers and equipment. American MPs at these checkpoints asked troops about things that every American was expected to know. In Operation Währung, a small number of German agents went behind Allied lines in American uniforms. They tried to bribe rail and port workers to cause problems with Allied supply operations. However, this operation was a failure. Within a week 250,000 troops had been sent. Gen. Gavin of the 82nd Airborne Division ordered the 101st to hold Bastogne. The 82nd had to battle the SS Panzer Divisions. Two separate westbound German columns got stopped by defensive positions up to ten miles from the town. Despite German attacks, the town held. The German commander, Lt. Gen. Heinrich Freiherr von Lüttwitz, requested Bastogne's surrender. When Brig. Gen. Anthony McAuliffe was told of the Nazi demand that he surrender, he refused. 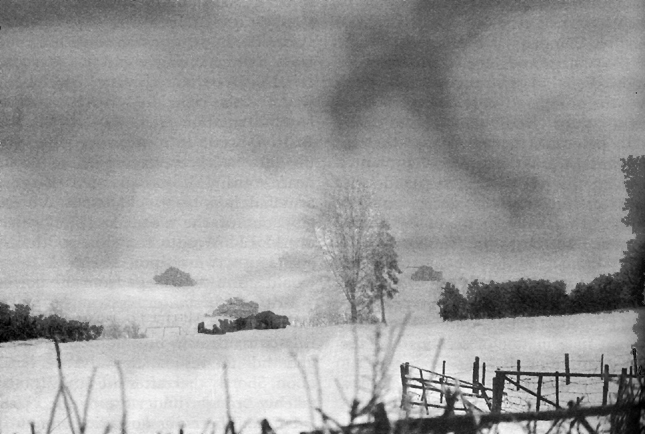 By 15 January, Seventh Army's VI Corps was fighting on three sides in Alsace. With casualties mounting, and running short on replacements, tanks, ammunition, and supplies, Seventh Army was forced to withdraw to defensive positions on the south bank of the Moder River on 21 January. 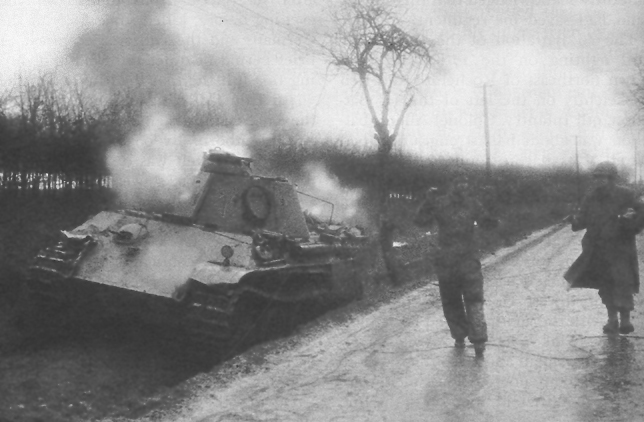 The German offensive drew to a close on 25 January. 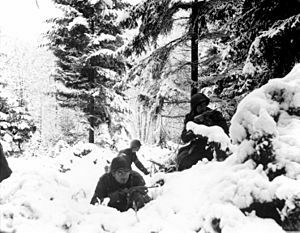 In the bitter, desperate fighting of Operation Nordwind, VI Corps, which had borne the brunt of the fighting, suffered a total of 14,716 casualties. The total for Seventh Army for January was 11,609. Total casualties included at least 9,000 wounded. First, Third and Seventh Armies suffered a total of 17,000 hospitalized from the cold. 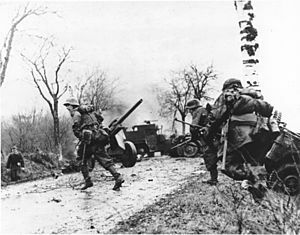 The initial success of Hitler's Ardennes offensive, launched 16 December 1944, caused Churchill to ask Stalin on 6 January 1945 for Soviet help by launching a Soviet attack. On Friday, 12 January, the Soviets began the Vistula–Oder Offensive, planned to begin on 20 January. During World War II, most U.S. black soldiers still served only as truck drivers and as stevedores. In the midst of the Battle of the Bulge, General Eisenhower was short of replacement troops so he allowed African American soldiers to join the white military units to fight in combat for the first time. More than 2,000 black soldiers had volunteered to go to the front. Battle of the Bulge Facts for Kids. Kiddle Encyclopedia.